The 10th Victim (1965). Production Designer/Piero Poletto (Eclipse, The Passenger), Set Decorator/Dario Micheli (The Last Emperor). 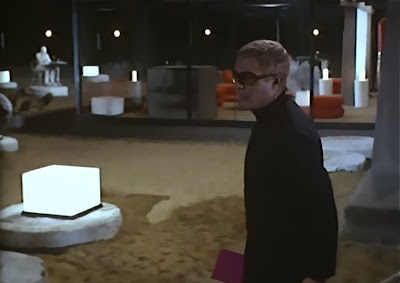 Great care was taken to give The 10th Victim an ultra-futurist look. The main characters, victim and hunter in an institutionalized game of murder, have a stylized, fashion-world presence that reminds me of Besson's approach to The Fifth Element (1997). 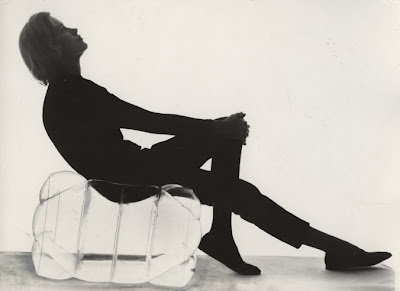 The style of the film owes much to Danish designer, Verner Panton, who introduced the world's first inflatable, transparent plastic furniture in 1960, and included Pop and Op-Art elements in his work. 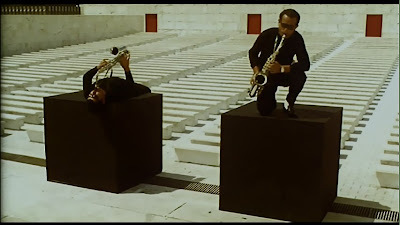 A geometric, minimalist scheme defines most of the rooms in the film, often using an Op-Art-like contrast of black and white stripes or forms. Furniture that is not inflatable tends to be simple cubes- sometimes lit from within. 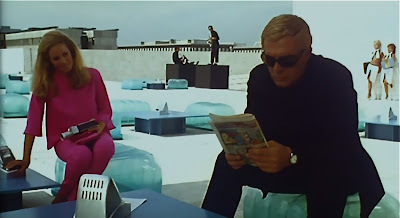 The warmth and color present in many scenes are provided by Ursula Andress, who balances the high-graphic style of the architecture and of Mastroianni's monochromatic suits (more on the film's fashion in an upcoming article). *Years after I published this, I was able to contribute to the Blu-ray edition of The 10th Victim. See Amazon & Blue Underground for more details. More 10th Victim on Spy Vibe from the search window and Labels menu. This is a new one to me...! Looks fantastic. 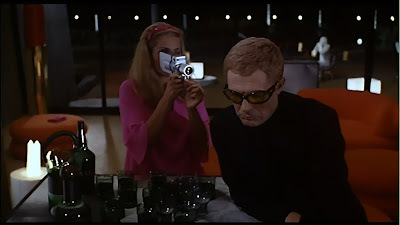 For trivia-sake: I should add that Ursula Andress assassinates her first victim in the film with a gun-bra, and she tries to lure Mastroianni to a TV commercial for "Ming Tea" so she can kill him on-screen- both were referenced by Mike Meyers in Austin Powers. This is one of my favorite movies!!! 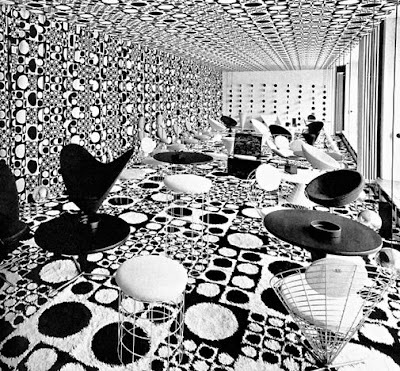 I love that amazing Panton room! Thanks so much for writing about it. Polly Magoo is fantastic. 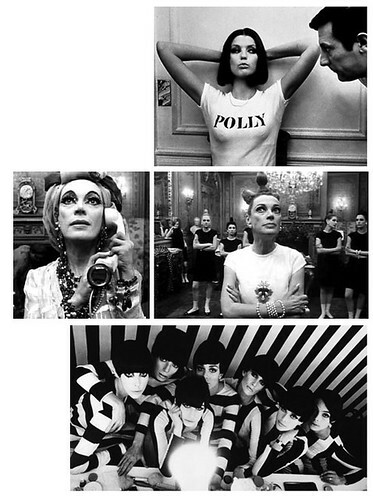 I'm guessing the Op Art still you've seen is the one with all the models made up like Peggy Moffit with her Sassoon bob? Have you seen this Japanese commercial from 1967? Super Mod. I'm in the middle of Polly Magoo- it is fantastic! Thank you for suggesting that Japanese commercial. So Cool!